Our factory is located in the middle-east part of France, in Montréal La Cluse between Lyon and Geneva. 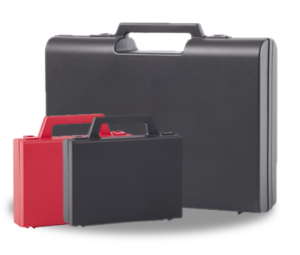 How and in which materials are your cases manufactured ? We are specialized in the injection moulding of thermoplastics. 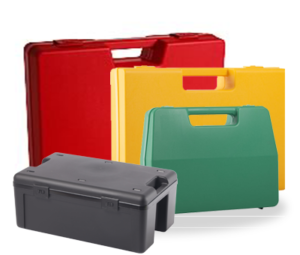 The material used for our cases are : Polypropylene (PP) for the main part, and also PMMA, PS and K.Resin. How resistant are you cases What are there properties ? 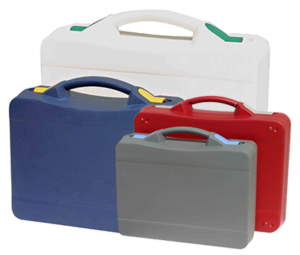 Our cases are made out of Polypropylene , which is a very resistant material to shocks and main chemical agents. They have been tested in Laboratory. They are recyclable and neutral for food ( except G2 made out of SHOCK PMMA). How resistant are the hinges ? 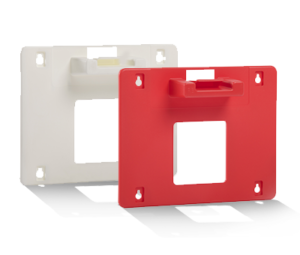 This “polypropylene living hinge” principle has been tested at over 100 000 flexings by the French National Laboratory with our cases ! 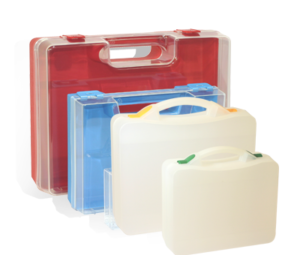 Can your cases be used for food products ? Yes , except the G2 made out of SHOCK PMMA. 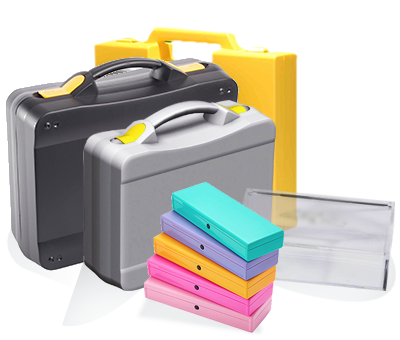 Do you manufacture custom-made cases ? If you already have a drawing , or an accurate idea of a new packaging, our R&D department will study your project and design the mould , under reserve that quantities are sufficient enough to recoup the cost of the mould. What are your manufacturing tolerances ? They are defined in our products specifications. 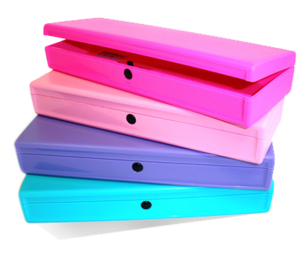 Can I choose a special color for my cases ? Yes, from about 5 000 pieces (depending on the size of the case) we realize your case in the color of your choice (Pantone or RAL). Are your cases anti-static ? No , but the inside-fitting may be . Are your cases waterproof ? Can we print on your cases ? Of course, this is made by silk-screen printing in our workshop. How do you test the resistance of your silk-screen printing ? We make a “Tear off Test ” with an adhesive tape. What do you need to make our printing ? Please send us vector files on a floppy disk , CD or by e-mail . We use Adobe Illustrator and need EPS, AI, DXF or IGES files . Please indicate your pantone color(s) , the size and the placement of the printing on the case ( a drawing would be fine ! ). Do we have to pay technical costs for every order ? (if the printing is identical / same size). Can we use the same silk-screen on different cases ( sizes) ? Yes, if the printing is strictly identical. Can you print inside of the case ? Can we print all sides of your cases ? Lid and bottom can be printed . What is the maximum size for a printing ? All the plane surface, about 1 cm from the borders. 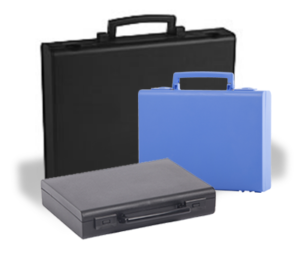 Can you supply custom-made inserts ? Yes, from 100 pieces, we can do it in foam or vaccum-forming . Send us your products and tell us more about the final use of your case , and we will send you our best quotation. What kind of insert can you supply ? Foam: egg-shape , stamped , curved to the shape of your products or drilled in different kinds of foams (PU,PE) densities and colors. Vaccum-formed: rigid plastic in different materials, thickness and colors. What do you need to study an insert ? We prefer to receive your products. Please tell us also how your cases are going to be used, what quality you need and if you already have a target price. A drawing can be useful but is not necessary. What is the cost of an insert ? It depends on the material used, on the process of manufacturing and quantity supplied. We may give you an estimation upon receipt of your products. How much is a quotation/a prototype for a custom-made insert ? We think about it. For the moment it is free. Can an insert be printed ? 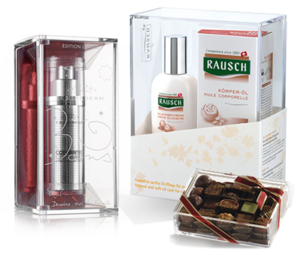 Yes, for vaccum-formed insert, we can either engrave in the mould, or print on the insert itself. For foam insert, it depends on your request and on the foam quality. How can we stick the insert ? With NEOPREN glue or an adhesive tape special for Polypropylene. Ex-works mainly , we can also calculate free-delivered home, CFR an Harbour, or Airport in France or abroad. What is your delivery time (shipment from factory) ? Until 1 000 pieces, available on stock. Above 1 000 pieces : usually within 2 to 3 weeks upon receipt of order. Existing printing : 2 weeks upon receipt of order. New printing : 3 to 4 weeks upon receipt of order and files. Existing : 4 weeks upon receipt of order. New insert : 5 to 6 weeks upon receipt of order and approved drawing or foam sample back with your products.